- September 4, 1973 Swearing-in ceremony for SEC Chairman Ray Garrett, Jr.
President Nixon's entanglement in the ethical crisis of Watergate, and the disclosure that the SEC Chairman G. Bradford Cook had perjured himself before Congress when testifying about the SEC's investigation into the illegal payment scandal involving financier Robert Vesco, created a crisis at the agency. (3) After Cook's resignation on May 17, 1973, Nixon calculated his response to criticism that he had politicized the agency by ending his previous practice of appointing political friends to the SEC. Garrett declined the offer, recommending that Nixon appoint A. A. Sommer, Jr., a Cleveland attorney and securities bar expert. Nixon refused to appoint Sommer, who was a Democrat. 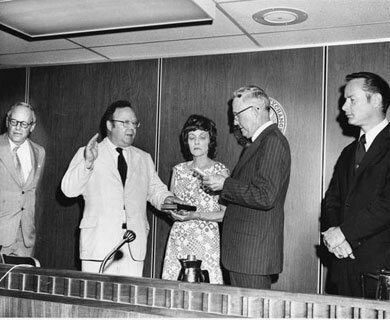 When the term of SEC Commissioner A. Sydney Herlong ended in June 1973, a deal was reached whereby Garrett would become Chairman and Sommer would replace Herlong on the Commission. Six months later, Nixon named Irving Pollack as his final Commission appointment. Pollack was a career SEC staff attorney who had served as both the Director of the Divisions of Enforcement and of Market Regulation, and who had played key roles in several ongoing issues, including that of fixed commission rates. Garrett, Sommer and Pollack joined SEC Commissioners Philip Loomis and John R. Evans to form a SEC Commission that, even as Nixon's Presidency collapsed, provided competent and expert leadership that laid the foundation for successful policy implementation at the SEC. "Bank Participation in Securities Activities," Address by SEC Commissioner John R. Evans to Practising Law Institute. Memo from Dean Burch on meeting with Ray Garrett, Jr.
Letter from Theodore Barreaux to Richard L. Still, U.S. House of Representatives on employment request from Charles F. Rogers, Jr.
Letter from Theodore Barreaux to Charles F. Rogers, Jr.
Letter from President Ford accepting resignation of SEC Chairman Ray Garrett, Jr. Program for the SEC Memorial Service for Ray Garrett, Jr.
Swearing-in ceremony for SEC Chairman Ray Garrett, Jr.